The Leader Building was constructed as the headquarters for a now-defunct newspaper. The building features an ornate lobby with entrances off East Sixth Street and Superior Avenue. In 2016, redevelopment started to convert the building into a mixed-use property. This ziggurat shaped tower won an award from the Cleveland chapter of the American Institute of Architects upon its completion. The building houses multiple departments for the Cleveland Clinic's operations. This building was constructed as the flagship department store for the Higbee Company and is part of the Tower City Center complex. The Higbee Company occupied the building until 1984 when it was acquired by Dillards department store. The building is now home to the JACK Casino (formerly Horseshoe Cleveland), and has been featured prominently in several films, including 'A Christmas Story'. This building was the first residential high-rise in the Flats. A three-story addition was completed in 2004, featuring a metal spire at the building's northwest corner. The building was originally constructed as the Statler Hotel and at one time contained over 1,000 guest rooms. The building also served as an office complex for several years. In 2001 the building was renovated and converted into residential use as 295 apartments. The complex includes a conference center as well as seven penthouse apartments on the top floor. The building's parking garage was formerly the Stillman Theater - decorative pilasters near the Euclid Avenue entrance are all that remain. This building was constructed as the original headquarters for the Illuminating Company. It features a brick exterior and a decorative terra cotta cornice. This Brutalist styled building and adjacent parking garage was constructed as a commercial office complex, and remained the tallest suburban office building in Cleveland until 2017 when a significant number of floors were converted to residential use, at which time it was renamed Center North. The original facade featured pre-cast concrete; the conversion to a mixed use structure involved some of the facade being replaced with glass. Built as the Halle Brothers department store, the store closed and was reconfigured into an office building. The Halle Building also serves as the storefront for the fictional “Winfred Lauder” store on the Drew Carey Show sitcom. The building is slated to open as an apartment building in 2018. This building was constructed as the Citizens Building and is home to the City Club, one of the country's oldest public speech forums. The building originally featured a Greek Revival-styled entrance. 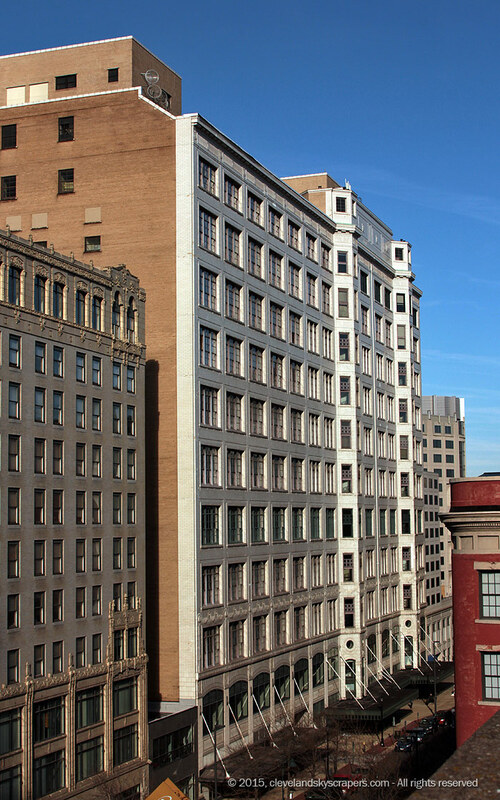 This building was built as the Wyndham Hotel at a prominent triangular site at Huron Road and Euclid Avenue in Cleveland's Playhouse Square district. In August 2017, the hotel was rebranded as a Crowne Plaza property. This building was constructed atop an existing three-story parking garage. Its glassy modern facade is a striking contrast to surrounding buildings in the Historic Warehouse District. This residential tower is the second tallest and westernmost highrise in Lakewood's Gold Coast neighborhood. This building was constructed as One Erieview Plaza and became the headquarters for Cuyahoga Savings bank. The site is part of the I.M. Pei-designed Erieview urban renewal plan. The building was renamed the IMG Center when the IMG talent agency relocated there. This building was originally named the Schofield Building, after Levi Schofield who designed Public Square's Soldiers and Sailors' monument. At one point, the original facade was covered and a clocktower/cupola feature was removed. The building was also known as the Trans Ohio building when the Trans Ohio financial corporation occupied it. In 2013, redevelopment into hotel/residential use commenced and the building's original facade was restored; the redevelopment was completed in 2016. This building was constructed as the headquarters of a historic private club, containing amenities such as a gymnasium, bowling alley and swimming pool. A notable exterior feature is the terra cotta facade, and the window groupings starting at street level as large single-pane and narrowing to slim triple-pane at the top of the building. In 2007 the namesake club closed due to financial difficulties, in 2017 the building is undergoing redevelopment into a mixed-use facility containing 177 residential units. This hotel was constructed on the site of the former Omni International Hotel, a 17-story structure which was demolished in 2000. This building contains approximately 325 hotel units and is centrally located on the Cleveland Clinic campus. This building was scheduled for demolition on two occasions - in 1971 to make way for an addition to the adjacent Marcel Breuer-designed Cleveland Trust Tower, and again in 2006 when the then-Cuyahoga County commissioners planned to build a new headquarters on the site. Neither plan came to fruition and in 2014 the building was redeveloped into a residential component of "The 9", a mixed-use development that also includes the Cleveland Trust Tower and the landmark Cleveland Trust Rotunda. A notable feature of the building's restoration involved the reconstruction of the decorative cornice which had been removed decades ago. This 375,000 square foot structure occupies a prominent site in University Circle at Euclid Avenue and Cornell Road. The building was constructed to house and centralize the cancer-related operations at University Hospital's main campus. One notable feature is the exaggerated curved facade on the western side of the building. This building was constructed as part of the Tower City Center complex in tandem with the nearby Chase Financial Plaza. Both structures feature a postmodern design, but proportions and facades intended to complement the adjacent historic landmark buildings such as the Terminal Tower. This building was constructed as part of the Tower City Center complex in tandem with the nearby Skylight Office Tower. Both structures feature a postmodern design, but proportions and facades intended to complement the adjacent historic landmark buildings such as the Terminal Tower. The upper floors of this building are home to the Ritz-Carlton Hotel. At the time of its construction, this building was the largest office building in Ohio and considered to be on the "fringe" of Cleveland's central business district. It was developed by Benjamin Rose, a notable innovator in the refrigerated meatpacking and shipping industries. The building is home to Medical Mutual of Ohio, a health and life insurance company. Built on the site of the former headquarters of the Cleveland Plain Dealer newspaper, this building added much-needed space to the Cleveland Public Library's downtown facilities. The four stone-clad turrets at each corner reference the roof lines of the adjacent buildings in the 1903 Group Plan configuration. The building is separated from the original facilities by the Eastman Reading Garden featuring a Maya Lin-designed fountain and sculptural work by Tom Otterness. This building was constructed as the Hotel Cleveland and was the first major building in the Union Terminal group. The hotel originally contained 1,000 guest rooms but over the years the amount was reduced to 440 to accommodate modern tastes. From 1958 to 1977, the hotel was operated by Sheraton Hotels and in subsequent years changed ownership several times; since 1996, the building's official name is Renaissance Cleveland Hotel. The lobby of the hotel features a decorative fountain and is connected to Tower City Center. This structure was built on the site of the former headquarters of the Jewish Federation of Cleveland, designed by notable architect Edward Durrell Stone. This building contains 240 residential units and features a brick facade. Crown Centre I and II are located in suburban Independence, south of Cleveland. The pyramidal tops of the towers are illuminated with green neon at night. View from the Cleveland Clinic. This Tudor Gothic landmark occupies a prominent site at the southern edge of University Circle. The highly detailed structure was built as a private club for men, then served as a hotel. Eventually the building was converted into housing for students at Case Western Reserve University and until 2007 served as the headquarters to the Cleveland Jobs Corp. After a $22 million redevelopment effort, the building opened as the Doubletree by Hilton Tudor Arms Hotel. This residential building was built as the second phase of the Stonebridge mixed-use complex on the West Bank of the Flats. Its notable features include a glass and steel facade and curved accents on the roofline. This building and several adjacent mid-rise structures were constructed along the Superior Viaduct as part of the Stonebridge mixed-use complex on the West Bank of the Flats. This building is one of the oldest on Public Square and considered to be Cleveland's first "skyscraper". In 1991, the building was incorporated into the design and construction of Key Tower. A light court was filled in with office floors, however the banking lobby's stained glass ceiling was preserved and is artificially illuminated. This building also features a decorative lamp on its southwest corner, representative of the first electrically illuminated streetlight. The Arcade was built in 1890 and designed by John Eisenmann and George H. Smith. The construction was financed by John D. Rockefeller, Marcus Hanna and several other wealthy Clevelanders of the day with a cost of $875,000. The inspiration of the project is said to be the Vittorio Emanuele in Milan, Italy. Although pedestrian arcades exist in several North American cities, few compare to the grandeur of the Arcade in Cleveland. In 1973, the Arcade was the first building in Cleveland to be placed on the National Register of Historic Places. The structure includes the famous skylight-capped atrium as well as two 9-story towers, one each on Euclid Avenue and Superior Avenue. The top floor features gargoyles which circle the entire atrium area. In 1940, the Arcade underwent renovation which included two major changes - the Euclid Avenue facade and the Superior Avenue staircase. Both were redesigned in an Art Deco fashion which was a popular style of the period. The Euclid Avenue facade was altered to include two sculpted "medallions" of Charles Brush and Stephen Harkness, former presidents of the Cleveland Arcade Company. The Superior Avenue staircase was redesigned to accommodate a small retail space. By the 1970s, the Arcade had suffered along with the decline of Euclid Avenue and downtown Cleveland. Although it never lost its opulence, the retail tenants felt the effects of much of Cleveland's population fleeing to the suburbs (and taking business with them). The Arcade was actually threatened with demolition as some myopic developers had plans to erect a 20-story office tower. Fortunately, sensible minds prevailed and the Arcade was maintained for several decades until it was redeveloped once again. In 2001, The Hyatt corporation redeveloped the Arcade into Cleveland's first Hyatt Regency hotel. The Hyatt Regency occupies the two towers and the top three floors of the atrium area. The two lower floors of the atrium area remain open to the public with retail spaces and a food court. In addition, the Hyatt's lobby and offices are located near the Superior Avenue entrance. This building was constructed as the Hotel Winton, then renamed the Carter Hotel in 1931. It was converted to full time residential use in the 1980s, and then redeveloped into 270 units of affordable housing for seniors in 2004. The building's history includes the former Rainbow Room restaurant where Chef Hector Boiardi featured Italian cuisine; he then developed his products for widespread distribution under the Chef Boyardee label. Originally built as the Medical Center Building, this building features extensive decoration on its lower and upper floors. The building has been restored and converted to a 70-unit apartment building. This 10-story tower was completed in November 2008 and is home to the Heart and Vascular Institute of the Cleveland Clinic. A notable feature is an indoor/outdoor pavilion located on the tenth floor, offering panoramic views of the downtown Cleveland skyline.